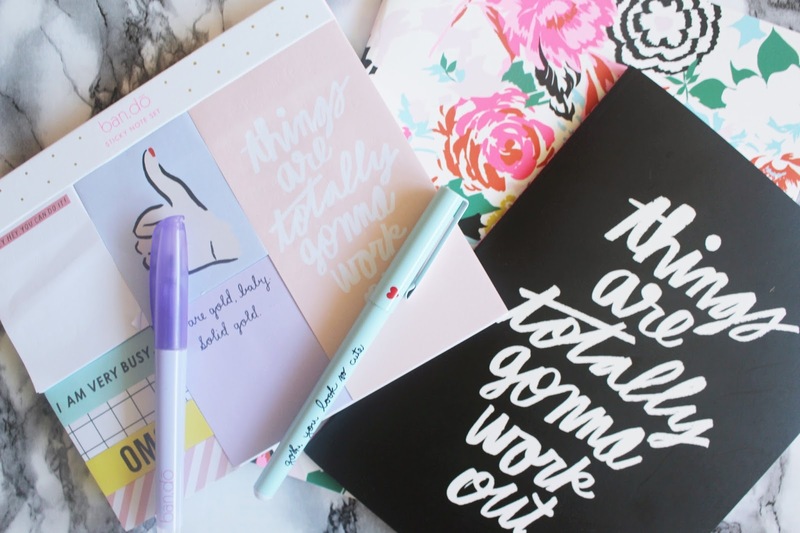 Starting University/college/school is always so exciting to me because it means I get to buy new stationary which makes me feel really productive (even if I end up not using it – but most of the time I do!) I really love these cute bits from Ban.do which have come so in useful to me at UCLA. From Ban.do I bought some paper bits such as the Good Ideas Notebook Set and the Sticky Note Set. The Sticky note set is one of my favourite items from Ban.do because it features different size sticky notes including some very small ones to mark important things in the books I’m reading. These are so useful for an English student who constantly has to look back at important passages later on in the term. Surprisingly it was one of the cheapest items I bought and one of the most used so I’d highly recommend buying one of them plus it’s very handy to have on your desk so you can see everything you’ve noted down. I always have had little print outs at school of different things teachers have sent me or my own work I love keeping them in the same place so the Get It Sorted File Folder Set is really useful for keeping loose sheets organised. At the moment I’m keeping my short stories in there for my Creative Writing class. I wanted some cute pens and highlighters to keep my notes looking neat and to motivate me to get handwriting again so I bought the Hot Spot Highlighter Set and the Sweet Talk Pen Set. The highlighter set has orange, yellow, pink, purple and blue. I love the purple one as it’s such a rare highlight colour! The pens have cute little slogans on such as ‘You are better than unicorns’ which is really nice to read when you’re in class! If you struggle keeping focusing and lack motivation in class then those pens may help you. Moving away from stationary I bring you a couple of travelling accessories that I think are to die for! I’ve never had a passport holder or luggage tag and considering the amount of moving around I do I find that pretty funny! 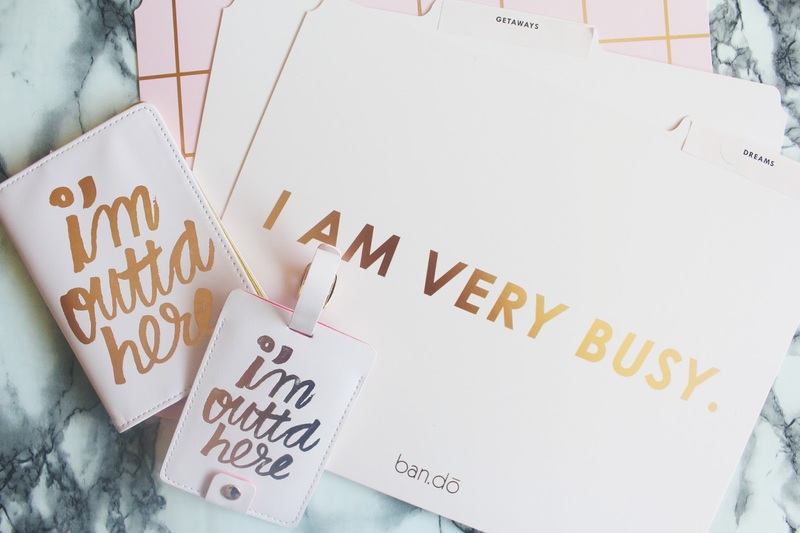 The I’m Outta Here Luggage Tag and Passport Holder duo is SO pretty! 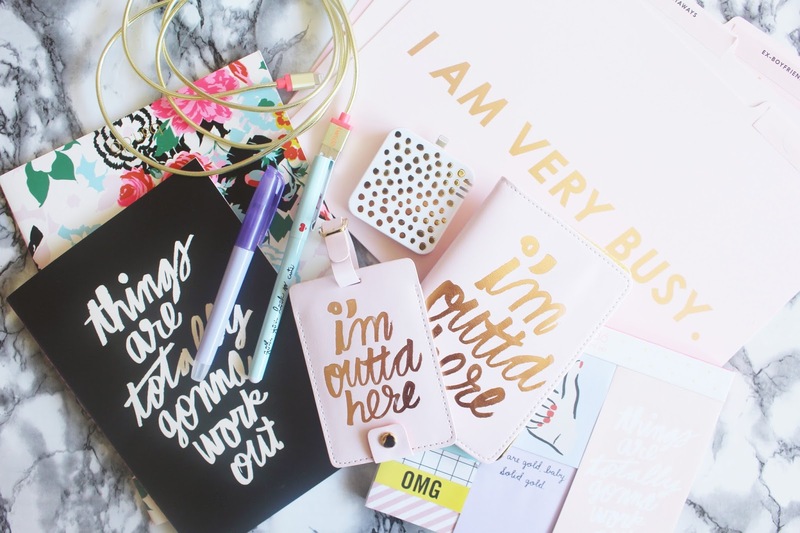 I love the pale pink and gold and I think the font they’ve used for the items are very pretty. I’m excited to go away now to put them to good use. My tech-y items are purely for my phone. I absolutely hate the iPhone charger chords that come with the iPhone as they’re far too short and just don’t look cute. I bought the Back Me Up! Charging Chord because I loved the golden colour and because it’s about a metre longer than the default chord which means my phone can stretch onto my bed and I can wake myself up by looking at social media. I also bought a portable charger because the I’mUp charger I was sent a few weeks ago broke. 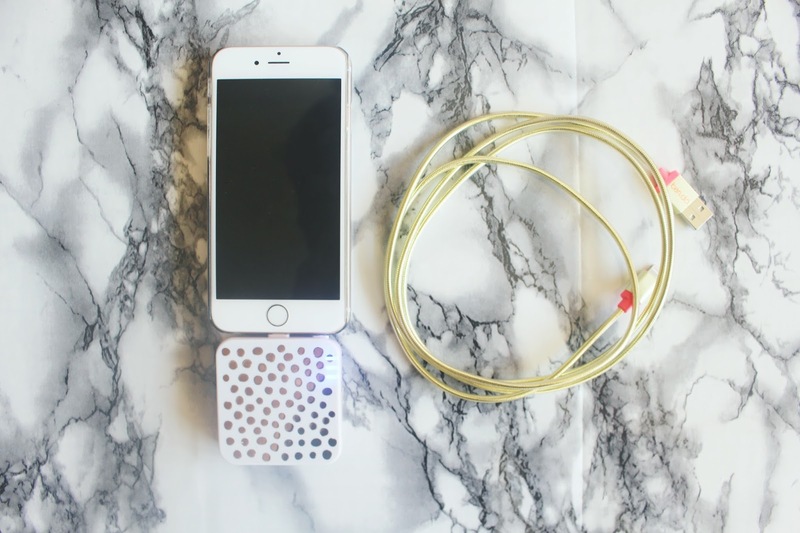 The Back Me Up Portable Charger comes in lots of different designs but I really loved keeping it gold as well as my charging chord. You simply plus the portable charger into your laptop to charge and then into your iPhone input. I’m such a huge fan of all of these items but let me know which ones are your favourites! Are you coveting anything else from Ban.do? I want all of these. This is so pleasing, just adds the appeal and the vibe to really write something on it.